Very peaceful in a country in front of the sea. Villa Giò is a small cottage located 200 m beside a little sandy beach enclosed in a rocky coast, where you can smell the perfume of the country together with the sea breeze. The cottage is distant from Sampieri about 500 m.
The house is a new building,it has a garden with mediterranean flavours (lavender,rosemary..). 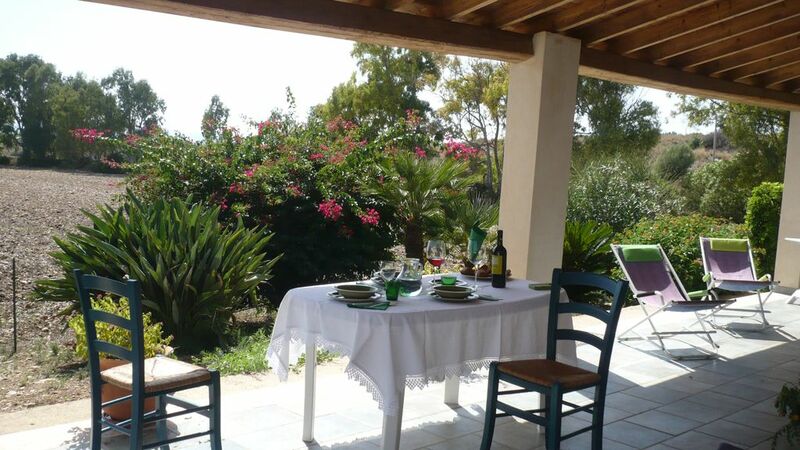 Around the cottage there's natural vegetation with various typical mediterranean plants (carrubo,olivo,palma nana).You need not air conditioning because the house is naturally cool. In Sampieri there are supermarkets,bakery,bars,pizzarestaurants,pharmacy,post office and also another beach about 2 km long,with a characteristic old kiln named "Pisciotto". Sampieri is located in the baroque area,part of a United Nation World Heritage site.The baroque area includes Scicli(8 km),Modica (20 km),Ragusa Ibla(26 km),Noto(40 km),towns famous for wonderful churches and palaces baroque style. Visit also several archeological sites:Syracuse,Piazza Armerina,Agrigento-Valle dei Templi. At about 10 km is located Pozzallo, where you arrive in Malta for catamaran day trip. You can enjoy beautiful sun and sea from April to November. Very good location, views, veranda. We enjoyed our week at Sampieri. A lovely spot with a great veranda. The beach down the road is good and just 2 km away is the long beautiful beach of Sampieri. We were here in late September and the water was warm and the beach was nearly empty. We spent several days visiting the lovely baroque mountains towns of Modica, Ragusa, Scicli and Ispica and the Villa is an easy drive to all these places. Unfortunately, the bathroom’s shower is very small and difficult to enter and we noticed some odor present. This is a good place for a couple or family with small children or friends. The attic room is comfortable but the ceilings a so low that it is difficult for adults to use the upstairs. The main bedroom is very comfortable although the second bedroom is quite small. We cooked many of our evening meals and the kitchen is not the best but we managed. With a little thoughtful planning this villa would be outstanding. If you don’t mind some inconviences this is a great place. Thanks Bonnie. Overall it seems to me that you have had a pleasant holiday. I think it 's difficult to find a holidayhouse that looks like our house perfectly, especially if we have passed a certain age. Dai! the attic for half is 2.10 m high. However I give you reason: the ideal guests for my house are a young couple with children even teenagers, but when guests book I don't know how the group is formed. When I know and I don't consider it suitable, I mentioned it. schöne Nachsaison; wir waren sehr zufrieden. Danke. Kurz gesagt, die Anziehungspunkte, die das Haus und Sampieri lieben. Das Haus entspricht den Bildern. Es ist zweckmässig, schlicht eingerichtet und sehr sauber. Der Garten ist noch schöner als auf den Bildern. Das ganze Haus ist von einer Terasse umgeben, so dass sich zu jeder Tageszeit und Temperatur ein geeingetes Plätzchen findet. Wir waren zu Viert dort und haben draußen gelebt. Übergabe und Absprache mit der Hausbesitzerin Carmela liefen perfekt, vielen herzlichen Dank. Das Haus liegt ruhig 200m fussläufig zu einem eher ruhigeren Strand, an dem man auch Liegen leihen kann (perfekt um vorm Frühstück schon ins Meer zu springen), 1km fußläufig (am Meer entlang mit toller Aussicht) zum belebten Strand. Um die tollen Barockstädte zu besichtigen ist ein Auto erforderlich. Sollten wir den nächsten Erholungsurlaub planen kommen wir wieder. Zuerst entschuldige ich mich für die schlechte deutsche Sprache, aber ich hoffe, meinen großartigen Dank für die wunderbare Kritik zu äußern. Ich bin immer froh, wenn meine Gäste mir danken, dass ich einen tollen Urlaub gehabt habe und Martin hat auch gezeigt, dass er sich für 5 Tage seines Aufenthaltes ausdehnt. Wir waren begeistert von dem Haus und von der Herzlichkeit der Vermieterin. Es war perfekt, genau das was wir gesucht haben: weit weg vom Trubel und in schöner Natur. Und dazu das Meer hören und sehen, genial! Die Terrasse des Hauses wurde von uns dauergenutzt, sie ist einfach klasse. Die Ausstattung des Hauses ist genau ausreichend, vor allem ist alles sauber!!! Grazie Carmela, abbiamo trascorso, grazie a lei e la sua carina villetta, bellissime vacanze. Grazie Maria Carmela. Sono veramente contenta di avervi ospitato . siete stati degli ospiti graditi e discreti che avete apprezzato la nostra disponibilità . Per noi siete degli amici che scelgono un posto gradevole dove soggiornare e facciamo di tutto per soddisfare i vostri desideri. "L''alloggio è conforme alla descrizione, ottima pulizia, gentile e squisita l''accoglienza della signora Carmela. La casa è l''ideale per vacanze tranquille, fresche anche nelle giornate di calura estiva, a pochi passi dal mare e dal piccolo borgo di Sampieri. La casa si è dimostrata un ottimo punto d''appoggio per scoprire una zona circostante ricca di interessanti località sia storiche sia culturali che paesaggistiche.L''abitazione è ben attrezzata e viene effettuata una buona manutenzione che la rende efficente, il giardino e lo spazio circostante sono pregevoli e le conferiscono un particolare fascino." From Catania follow the motorway Catania-Siracusa, then Rosolini,Ispica, Pozzallo,Sampieri stopping at the camping "La spiaggetta".The entrance of the house faces the camping. The ownership is avaible for provide additional information and guide your bringing.